Visit the Maryland Robotics Center's YouTube channel to view the instructional video and download written instructions and CAD files. Because entering the field of robotics can cost thousands of dollars in hardware and software, the barrier to entry has been quite high. By contrast, the software field has recently embraced the open source concept, allowing a newcomer to easily get started with very little initial cost by building upon software created by others. Professor S.K. Gupta (ME/ISR) and Gregory Krummel, an undergraduate student in the Mechanical Engineering Department, are adopting the open source concept for robotics hardware. Gupta is the director of the Maryland Robotics Center. They have developed an open source crocodile robot design for teaching introductory concepts, offering a new learning opportunity for those with an interest in robotics. The crocodile robot features an articulated tail, mouth, and legs. It can demonstrate walking abilities and sensor-based obstacle avoidance. The open source design was developed with educators and hobbyists in mind. Previously, robots had to be designed and built from the ground up—a formidable task for beginners—or purchased off the shelf. Gupta and Krummel provide written instructions and computer-aided design (CAD) files on the open web. Individuals then can fabricate and/or purchase their own parts from electronics suppliers and build the crocodile robot for a reasonable price. Those who are entrepreneurs could use the free open source design files to fabricate pre-cut parts and aggregate them with electronics into a kit to sell to those who do not have the equipment to cut parts themselves. The crocodile robot design is intended to teach high school students programming, sensing, and construction skills. Maryland Robotics Center researchers are continuing their work on open source designs and plan to offer more complex platforms and kits in the future. 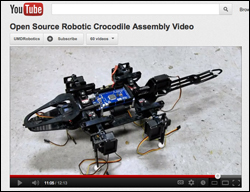 An instructional video, written instructions, and CAD files for the crocodile robot can be found on the Maryland Robotics Center’s YouTube channel.